I’m writing ProjectFolders – the succeed product of Writing Outliner, due to reasons I stated in this blog (new data storage, improve stability and performance, etc). This video demo shows what I have right now. All data are open – your files are stored as they are in your hard disk. Your document are safe, because ProjectFolders will not alter your documents at all – except renaming, copying and moving them across your project folders. ProjectFolders is much faster, because of the new design. 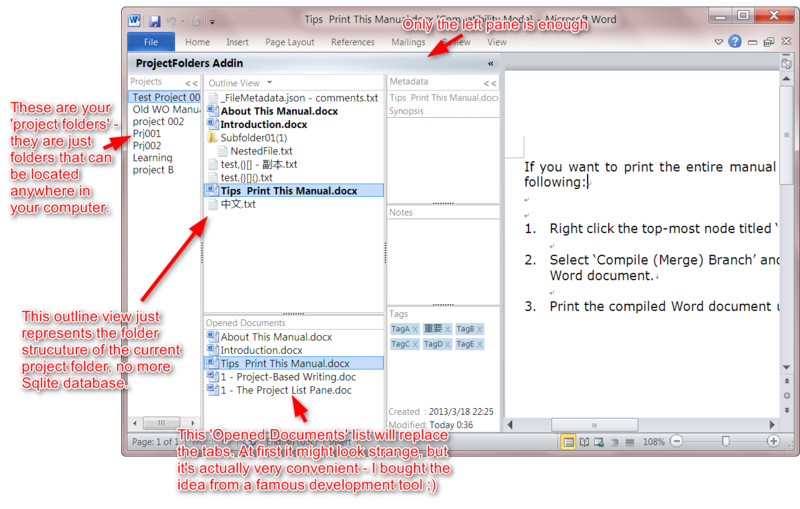 ProjectFolders will open your existing Writing Outliner projects. Questions and comments? Why not? That’s why I’m posting the news here in the blog. And here is a screenshot, but I encourage you to watch the video demo.